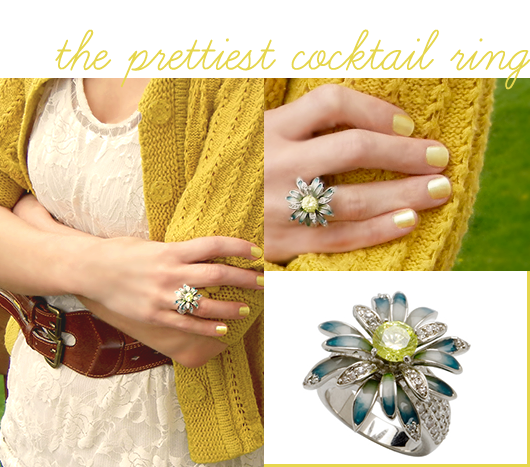 Bubby and Bean ::: Living Creatively: Pretty Cocktail Ring from Lucid New York! Pretty Cocktail Ring from Lucid New York! A couple of weeks ago, I got an email from jewelry designer Anna Sabino. She said that she was a reader of Bubby and Bean, and that she wanted me to pick out of a piece of her handmade jewelry as a gift. It really made my day to get such a sweet email from a reader, and when I visited her website, Lucid New York, I fell instantly in love. Her work is incredibly versatile, and includes everything from elegant, classic rings, to cute little charms that are very on trend. I was torn between whether to chose one of her necklaces (as a fashion designer, it was hard to resist this adorable gold scissors necklace) and her gorgeous cocktail rings. In the end, I went for the pretty sterling silver flower ring above. I'm a big fan of vintage cocktail jewelry, and this piece reminded me of the rhinestone flower rings my grandmother used to wear. The ring is stunning in person, and I see myself wearing it with everything from fancy dresses to casual everyday outfits, like the one I'm wearing in the photos above. 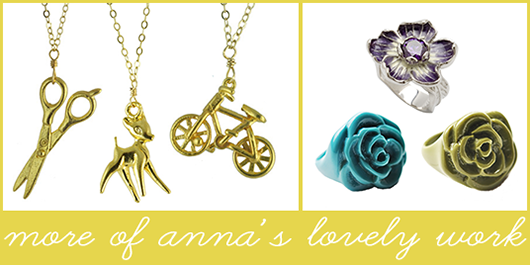 As an indie designer myself, I was also impressed with the fact that all of Anna's jewelry is handmade in the U.S. Producing my clothing designs locally is incredibly important to my mission as a sustainable designer, and I'm always thrilled when I meet other artists and designers with the same sentiments. I'm honored and grateful to now own one of her beautiful pieces of jewelry. Oh, and turns out, Ms. Sabino has garnered some attention from the likes of some little publications you may have heard of called Vogue and Nylon. Keep up the fabulous work Anna, and thank you for the lovely gift! Don't forget to enter our new giveaway for a chance to win a limited edition handbound copy of "The Luxurious Life of Rigel the Cat," worth $35! That ring is gorgeous! And so is ALL of her jewelry--wow, such beautiful work! I love it! I LOVE the ring you chose! It's so detailed and definitely looks vintage! And her necklaces are super cute too. Also love your outfit in the top pics. That cropped yellow sweater and lace top look so pretty together :-). I don't know which I like better - the ring or the yellow sweater and matching nails! OH WOW! I love all of it, but your ring is the best! i would love to know about that nail polish melissa! I'm in love with that ring, it's so your style! Love those pretty necklaces too. That bicycle charm is brilliant. Need to get myself one of those stat!! so pretty! I love the ring you chose! This is probably one of the prettiest features someone has done about Lucid New York. The collage is precious. Thank you! It definitely made my day. I'm so glad you love the ring. You chose a great piece! Wow, what beautiful jewelry :o And that ring is just lovely! Wow-that ring is gorgeous. Good pick! And I love your nail polish with the ring. Beautiful! Thanks for the sweet comments everyone! And thank you again the Anna for the lovely gift! The nail polish is plain old drugstore bought Sally Hansen brand. The bottle says HD Hi-Definition Nail Color, and the color is "Hue," #12. I am obsessed with the color yellow, and even though yellow nails aren't something anyone wants naturally ;), this polish is sparkly and the way that the light reflects it is really pretty.